FOR PAT MARTINO, a soul-jazz icon, it was like being "dropped cold, empty, neutral, cleansed . . . naked" into the world. In 1980, Martino--then one of the greatest jazz guitarists in the world--was diagnosed with a brain aneurysm and decided to undergo surgery after being told the condition could prove fatal. When the anesthesia wore off, Martino looked up hazily at his parents and his doctors, and tried to piece together any memory of his life. "It left me completely empty," says Martino, during a phone interview from Southern California. "The lengthy period for recovery contained a lot of very interesting conditions, and one of the most interesting of all was depression and a lack of decision to do something about that. That became procrastination and boredom, which became more and more amplified until it became crucial to do anything that could be done. When your back is against the wall and you're bored to death, you're even bored with procrastinating. When that takes place, you make a fundamental decision to do something and try to get active, just to cover the pain of it. You get busy." In the process, his life became more filled with interests, including the guitar. "When it did re-emerge," he adds, "it did so on its own terms but with no consideration of career orientation. So it was pure in the sense of not being abrasively interrupted with responsibilities to competitively fulfill other people's expectations." Today, Martino, 56--who performs Sept. 9 at the Russian River Jazz Festival--is once again rated as one of the finest jazz guitarists. His recent CD Pat Martino Live at Yoshi's (Blue Note), with organist Joey DeFrancesco and drummer Billy Hart, marks a return to the same organ-trio style with which the Philadelphia native first made his name 40 years ago. "Martino's lines are fast and clean," Entertainment Weekly opined recently, "propelled more by intelligence than hubris," adding that his "Blue in Green" is "mystical balladry, from someone safely returned from the dark side." FOR MARTINO, who is given to long philosophical discussions about life, his resurrection is the starting point of a spiritual journey from which he continues to learn. "It's initial for you to understand the simplicity of this and the irony as well," he says of his ability to remaster the guitar. "We begin to experience life on a continuous level, and it becomes implanted in us subliminally. It remains as a part of us from that time forward." 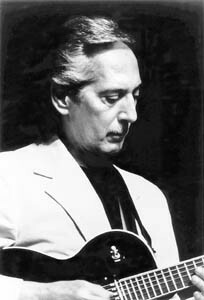 Born Pat Azzara, he was first exposed to jazz through his father, Carmen "Mickey" Azzara, who sang in local clubs and briefly studied guitar with Eddie Lang. He took Pat to all the city's hot spots to hear and meet guitarist Wes Montgomery and other musical giants. Martino began playing guitar when he was 12 years old and left school in the 10th grade to devote himself to music. During visits to his music teacher, Martino often ran into another gifted student, sax legend John Coltrane, who would treat the youngster to hot chocolate as they talked about music. Besides firsthand encounters with 'Trane and Montgomery, whose album Grooveyard had "an enormous influence" on Martino, he also cites Johnny Smith, a Stan Getz associate, as an early inspiration. "He seemed to me, as a child, to understand everything about music," Martino recalls. Martino became actively involved with the early rock scene in Philadelphia, alongside stars like Bobby Rydell, Chubby Checker, and Bobby Darin. His first road gig was with jazz organist Charles Earland, a high school friend. 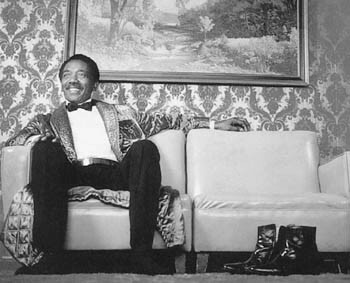 His reputation soon spread among other jazz players, and he was recruited by bandleader Lloyd Price to play hits such as "Stagger Lee" onstage with well-known musicians like Slide Hampton and Red Holloway. Martino moved to Harlem to immerse himself in the "soul jazz" played by Earland and others. The organ-trio concept had a profound influence on Martino's rhythmic and harmonic approach, and he remained in the idiom as a sideman, gigging with Jack McDuff and Don Patterson. An icon before his 18th birthday, Martino was signed as a leader for Prestige Records when he was 20. His seminal albums from this period include classics like Strings!, Desperado, El Hombre, and Baiyina (The Clear Evidence), one of jazz's first successful ventures into psychedelia. IN 1976, MARTINO began experiencing the excruciating headaches that were eventually diagnosed as symptoms of his aneurysm. After his surgery and recovery, he resumed his career when he appeared in 1987 in New York, in a gig that was released on a CD with an appropriate name, The Return. He then took another hiatus when both of his parents became ill, and he didn't record again until 1994, when he recorded Interchange and then The Maker. These days, he's perfectly content with this laid-back approach to his recording career. "Before the surgery, my interests were latent with competitive success. At this particular point, the music is there and it takes care of itself; it's a vehicle that brings me opportunities to interact with others and to gain insight through social interaction. "The opportunities that come through these things are a rainbow of color. It's an ongoing metamorphosis that continuously surprises me--almost a form of existentialism." The Russian River Jazz Festival returns to Johnson's Beach in Guerneville on Saturday and Sunday, Sept. 8-9, for a weekend of straight-ahead, smooth, and soul jazz. This year's lineup: on Sept. 8, Bobby Caldwell, the Bob James Trio, the Pete Escovedo Latin Jazz Orchestra, the Bobby Hutcherson Quartet, and Dan Hicks and the Hot Licks; and on Sept. 9, the Jimmy Smith Quartet, Pat Martino with Joey DeFrancesco and Billy Hart, and Mark Levine and the Latin Tinge. Tickets are $35-$80 for a one- or two-day pass. 707/869-3940. From the August 30-September 5, 2001 issue of the Northern California Bohemian.